Welcome to my official author website. Writing novels has been quite an exciting ride with many important lessons learned. I hope you will join me on my journey as an author and the many fun events to come. Don’t forget to check out my blog for info on events or to follow me on Twitter. Tell your friends to check out my tweets at twitter.com/CassandraUlric1. I also have a celebrity page on FaceBook -> Cassandra Ulrich, Author and a YouTube Channel. “Billiard Buddies is now available in print here. Also, “Love’s Intensity” has been transferred to a new publishing house – mine, and is currently only available Amazon. Check out @CassandraUlric1 to catch the latest news. Also, posted my most recent short story here? Please leave a comment so I know you stopped by. Work continues with getting Love’s Intensity in print, editing If It Kills Me and Danny R.O.S.S, and finishing the story about a girl from South Africa. Don’t forget to check out my YouTube Channel. Special Request: Whenever you visit my blog, any of my author pages, or Cassandra Ulrich, Author on FaceBook, please leave comments so I know you stopped by. Also, when you’ve finished reading any of my books, please leave an honest review. It only takes a few words, but it’s much appreciated. Reviews for A Beautiful Girl and Love’s Intensity can be found on this page. Your reviews are also appreciated at your purchase site as well as at Amazon and Goodreads. My short story Zale’s Tale was chosen as one of twenty-five stories set in Rehoboth Beach, DE to be included in Beach Fun by Cat & Mouse Press. The anthology will be released in the fall. 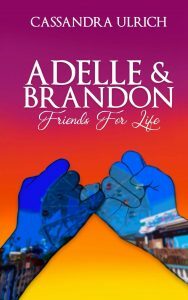 Another short story, Adelle and Brandon: Friends for Life, will be released on August 29th on Amazon. Reviews are much appreciated. Welcome to my now mobile friendly site. I look forward to sharing announcements and insight into my work while you’re on the go. I won First Place in the South Jersey Writers’ Group Poetry Contest in January 2018. Quick update: Join seven authors/poets on the #LoveIsInTheAir blog tour from February 8th thru 14th here. 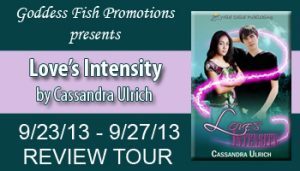 “Love’s Intensity” was re-released by Cassandra Ulrich on December 30, 2016 after Wild Child Publishing closed its doors. Fall is in full swing with Thanksgiving on the way. Although I’m not participating in NanoWriMo this month, I’ll be busy editing a few short stories. July is a hot month for poetry. Hopefully, you’ve seen my tweets about free Kindle downloads via Amazon. My four poetry books, including the ones recently available at my twin release of Encouraging Through Sharing and A Love Gift on June 25th, are on sale each Saturday this month, starting with July 9th. Join others who are reading these books. Don’t forget to review them too. Check out @CassandraUlric1 to catch the latest news. Also, did my most recent short story here? Please leave a comment so I know you stopped by. Summer is here at last, bringing along the upcoming twin release of two poetical compilations, Encouraging Through Sharing and A Love Gift. There’s also a new short story here. Work continues with getting Love’s Intensity in print, editing If It Kills Me and Danny R.O.S.S, and finishing the story about a girl from South Africa. Happy New Year! It’s 2016 and I’m looking forward to all I can accomplish this year. Plans include getting Love’s Intensity in print…finally, editing If It Kills Me and Danny R.O.S.S, publishing two poetical compilations, and finishing the story about a girl from South Africa. It’s going to be a busy year. I attended the Lawnside Heritage Day on a rainy day to sell my books. I’m so glad the tent kept the copies and customers dry. I am busy at work editing manuscripts this summer. Oh, and check out my YouTube Channel. I’m still working releasing Love’s Intensity in print. I will post here when it’s ready for sale. Lastly, If It Kills Me now has an editor. Time to get busy. Check out The Capital City Book Fair and come on out if you can on May 1st and 2nd. I will be among many vendors who plan to be there. It should be a great event. I recently held a book signing at The Treehouse for A Beautiful Girl, Real Purpose: You Are Special, and Life Experienced. It’s always neat meeting new people about my books. It’s even better when those people become friends who hang out for a bit to talk about life. Thanks to everyone who purchased copies. I also received news that the paperback format for Love’s Intensity will be available soon. I can hardly wait. Life Experienced:I released my second poetry book on August 20, 2014. Buy the print version here and the Kindle format here. Real Purpose: You Are Special has been released:I’m excited to announce the release of one of four poetry books. So proud of Haleigh’s work on the cover. Buy the print version here and the Kindle format here. Billiard Buddies has been released on Amazon? : Keith Publications released Billiard Buddies on April 24, 2014! Download your copy here. #romanceinjune :On June 14, I will be hosted on this blog -> . You may check out the other authors as well. It’s all month long. Are you ready for Billiard Buddies? : Keith Publications is getting ready for the release of this fun story. Stay tuned! I signed my 4th book contract! : Wild Child Publishing contracted If It Kills Me. I am very excited and can’t wait to witness the birth of the cover and its humourous story of an average guy who found out he’s fallen for his roommate’s girlfriend. My Navy SEAL story, Danny R.O.S.S. (2011 NaNoWriMo winner), didn’t fare so well, so I must figure out where to submit it next. Of course, the upcoming release of Billiard Buddies awaits proofreader approval. Be sure to “like” my fan page to hear about the release as soon as I know the date. I have also begun transfering scenes from sheets of paper to computer files. I find it amazing how I can be sucked into a scene I wrote months ago and manage to find where it fits into the overall story. It would be less challenging if the scenes belonged to the same story. Lastly, Andrea Cooper, agreed to host me on her blog on January 25th. I’m grateful that so many authors are willing to help each other reach a bigger audience. Visit my blog on February 1st for a chance to meet her. Happy New Year! :The year has only just begun but I already have a long list of things to accomplish. Topping that list is the upcoming release of Billiard Buddies and the transfer of scenes from sheets of paper to computer files. Featuring A Beautiful Girl and Love’s Intensity – These young adult novels are available on various sites and make great gifts for teens and older. See below for online stores and available formats. Go to this page for reviews. Featuring Danny R.O.S.S. – This is a story about a Navy SEAL. The contents thereof are held tight to the chest. For more, please go here. Featuring If It Kills Me – This is a story about an average American guy with a unfortunate problem. He’s fallen for his roommate’s girl. As if that wasn’t enough of a complication, someone dies. Currently in the submission process, I await word on its acceptance/rejection. I’ll keep you posted. Featuring Billiard Buddies – This novel is nearing the day when it will be available for the world to experience. A story of love and friendship, Billiard Buddies contains twists to keep you turning pages until the last sentence. I can’t wait to share it with you. Round one edits have been returned to the editor. I eagerly await round two. Go here to take a peek at the cover. A little blurb can be found here. Stay tuned for more news. Check out my publisher Keith Publications. Also, go to “KeithPublications llc” at Amazon to see all the 99 cent books on sale up till Oct.31st midnight and some free on the Oct. 31st midnight. I am also improving another manuscript for re-submission. Time to reread after connecting with my muse. Featuring Love’s Intensity – This novel has already received many great reviews for its depiction of love shared between ethnically different characters. Praise has also been received for parents who are very much a central part of the plot. The telepathic connection is merely the icing on the cake. If you haven’t yet read this dramatic story of two teens who are thrown together and expected to overcome their intense feelings, hate then love, for each other, you may purchase a copy at many sites online listed below. Also, check out some reviews here. Read an excerpt too. I’m halfway through round 1 edits for “Billiard Buddies” to be published by Keith Publications. Go here to take a peek at the cover. Stay tuned for more news. Featuring A Beautiful Girl – This novel has already touch many lives and hearts. If you haven’t yet read this powerful story of a young girl who discovers beauty within, you may purchase a copy at many sites online listed below. Also, check out some reviews here. Read an excerpt too. Now that the 11th Annual Collingswood Book Festival is over, I can return my attention to editing some stories. I’m currently working on round 1 edits for “Billiard Buddies” to be published by Keith Publications. Go here to take a peek at the cover. Stay tuned for more news. I am also improving another manuscript for re-submission. Just a few chapters left. No news yet from the literary agent. We’ll see what happens. Take a peek at the recently updated pages, Published Manuscripts and Billiard Buddies. I’m also gearing up for some Blog Review Tours starting September 23rd. Check out the events listed on my author page on FaceBook. 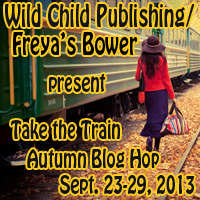 To visit the Autumn Train Blog Hop, click the picture below. I had a great time at the 2013 Arts and Authors Extravaganza at the Mansion in Voorhees, NJ, on August 18, 2013. Many talented authors and artists were in attendance. I am currently waiting for more information on another event on August 24th. It’s a busy month. On August 15, 2013, I’m very excited that I finally found the time to write during the past week. I also had a brief encounter with rehearsing in a friend’s play for the last three weeks. For now, that opportunity is on hold, but it was a neat experience. On Sunday, August 18th, I will be attending the 2013 Arts and Authors Extravaganza at the Mansion in Voorhees, NJ. I can hardly wait. Stay tuned for the revelation of the cover for an upcoming novella. On July 17, 2013, “Love’s Intensity” went live on Barnes & Noble, Kobo Books, and iBooks. On July 12 – 14, 2013, I attended summer writer’s camp sponsored by MFRW. On July 11, 2013, Wild Child Publishing released “Love’s Intensity”. Novel also went live on Amazon and All Romance Books. On June 26, 2013, with the proofreading phase complete, “Love’s Intensity” is almost ready for the public. Check out the event at Book Release: “Love’s Intensity.” Also, recording of “A Beautiful Girl” is almost complete. On May 18, 2013, I attended my second recording session for A Beautiful Girl. On February 24, 2013, I attended a Black History Celebration at the Kennedy Center in Willingboro where Reverend Willie Janes, Sr (Civil Rights Activist) and Don Evans (Playwright & Educator) were honored. On February 17, 2013, I attended the 2nd Annual Heritage Cultural Book Fair at Burlington County College. It was a great time. February 2013: So, since the last time I wrote, I finished my initial run through of the teen romance manuscript. The editor has since returned it for further tuning. With the minor issues fixed, I am ready to deal with the meatier stuff. Editing is a lot of work, but I am totally enjoying every second. October was a busy month with the Collingswood Book Festival, a Vendor Event in Oaklyn, and a book signing at Black and Nobel in North Philadelphia. On Saturday, September 8th, I joined the Youth Advocate Program (YAP) in Camden, NJ for a Youth Explosion where vendors, singers, and dancers were in attendance. YAP handed out free backpacks – all displaying “A Beautiful Girl” on the front – to the youth in attendance. On August 18th, I attended a book event in Willingboro, NJ at the Willingboro Library where each author donated a copy of their published works – books or DVDs. Spoken word artists were also in attendance. In July, I made my first sale in the Germany on Amazon(R). Then in August, someone in Australia purchased a couple copies via iBooks. Thanks so much.